This is a short video highlighting concussions and local athletic trainers. Dr. Bowen is the team physician for the Southeast Missouri State University Redhawks, and works with the athletic trainers of the various college teams as well as high school athletes. Dr. Bowen talks about the common phrase of “getting your bell rung,” and why that needs to go away. People need to understand that concussions are serious. Also, he mentions the ImPACT tests in use at the area high schools through Saint Francis Medical Center. The Medical Minute is a series that Saint Francis Medical Center out of Cape Girardeau, MO produces for local television. Grant Wahl of Sports Illustrated posted an article about concussions in soccer. 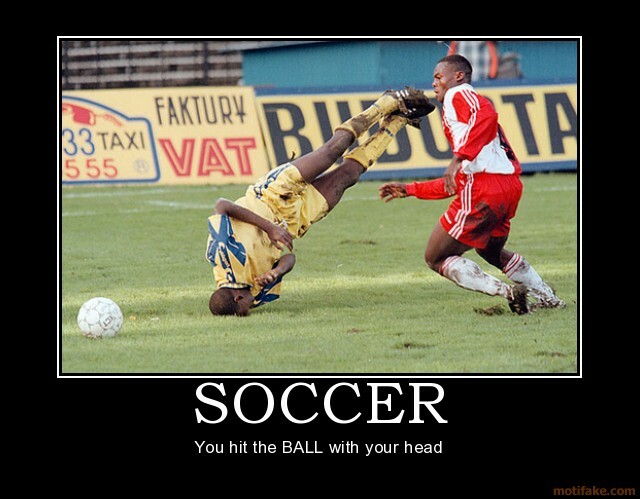 Did you know that soccer only trails football and hockey in number of concussions reported? Football may be attracting the most attention for head injuries in sports these days, but fútbol has also suffered a rash of concussions that have derailed the careers of prominent U.S. players. According to Dr. Robert Cantu, a concussions expert at the Boston University School of Medicine, soccer provides the third-highest number of his patients among professional athletes, behind only football and ice hockey. But unlike those sports, soccer has two big differences: Its players don’t wear helmets, and the pro and international games allow only three substitutions per match with no chance to return, putting pressure on teams to make hasty decisions to keep injured players on the field. The MLS has formed a Concussion Program Committee and it has 12 members and a chairman. One of the members on the committee is Taylor Twellman (remember him) and his experiences with post-concussion syndrome. The committee has yet to have written policies, but is working hard to create some direction for soccer. FIFA does not have a policy and either does the Champion Leagues of Europe. This would be a great opportunity to set a policy for the world to follow. The Associated Press ran an article about rugby and how it compares with football in terms of concussions. Rugby players are taught to never use their head in making the tackle, and without a helmet to protect them, the logic is pretty clear. Any player leading with the head is almost certain to get hurt as badly as the person he’s trying to hit. The injury rate in rugby varies, however the most recent study suggests concussions account for 19% of all head injuries reported. A study done by the B.C. Injury Research in Canada says rugby injuries come at almost three times the rate as those in football and soccer. But another study performed by the Eastern Suburbs Sports Medicine Centre in Sydney and the Australian Rugby Union found that while head injuries were most common in the collection of games they studied — adding up to 25 percent of all injuries — three–quarters of those injuries were lacerations, while only 19 percent were concussions. Meanwhile, both sports struggle to keep accurate concussion statistics. Finally, rugby may have more of a problem of players failing to report concussion symptoms. Last season, the NFL mandated that any player who gets a concussion should not return to action on the same day if he shows certain signs or symptoms. The International Rugby Board has a rule that calls for players to take a three–week break after being diagnosed with a concussion. That three-week break may make some competitors more reluctant to report head injuries. Obviously there needs to be a balance, and playing without a helmet may not be the answer either. AP Article via TMCnet.com (link not working for AP story). Vin Ferrara is the CEO of Xenith and believes that he has found a way to make a football helmet that could revolutionize the game in terms of concussive episodes. The X1 helmet is used by a very small number of professional players, because they are not provided by the NFL/team due to contracts with Riddell and other makers. Mr. Ferrara is working hard on getting his product out, including great programs with lower level football, extending down to the high school level and earlier. There is a purchasing program they have developed to get these helmets on heads as fast as possible. I have yet to work with these helmets at my school, however I have convinced the administration and coaches to purchase some for our use. It’s a tough task to eliminate the concussions, and we probably will not, but prevention is the best medicine, as well as being prepared. First and foremost, anyone involved in athletics should believe that prevention of neurological injury is of paramount importance. An undercurrent of “concussions are inevitable, we just have to manage them” permeates the sports world. Just because some concussions may still occur, this does not warrant an attitude of complete resignation towards preventing the injury. Prevention is possible. Prevention is critical. I would also like to thank Mr. Ferrara for recognizing the importance of certified athletic trainers as well. This is the second part to the concussion series being run by The Quad City Times and the prep section, written by Doug Green. The first one was yesterday and focused on the injury itself. Today’s story is about the athletic trainer and how they are at the front line of this issue. As an athletic trainer I feel that our profession is not only capable but NEEDED at all levels of sports. Either on-site for the games/practices or a phone call away. A lot of educational time is devoted to head injuries for athletic trainers, and our continuing education requirements offer us the ability to continually learn in this area. Sure, we are not MD’s/DO’s but our experience and rate of seeing these injuries make the athletic trainer somewhat of an “expert”. As one doctor in the article states, deferring to the athletic trainer to know if the athlete is “right” is, in fact, a prudent and important step in returning athletes. Know what an athletic trainer is, HERE. I am going to say he will be fined 20 large or more. And in the NFL, you do have to have the warrior mentality, but one should know that lowering the head to use the helmet as a weapon is not only dangerous to the other guy, buy yourself.